If you have tried to execute the following code on windows azure then no doubt you have run into a security violation. In fact if you try and run the same example on your local machine you will also get the same error as creating an custom event source on windows requires that it be performed by an Administrator. 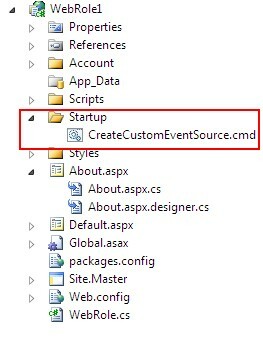 EventCreate /L Application /T Information /ID 900 /SO "MyCustomSource" /D "Custom source for logging my custom events"
Here are the options for EventCreate.exe /? 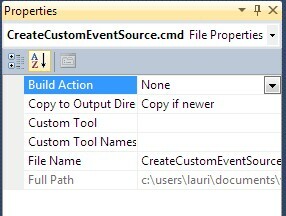 3) Right click on the cmd file in solution explorer and select properties and set the "Copy to output directory" to "Copy if newer"
4) Open the ServiceDefinition.csdef file and add the startup section as shown below. Ok, so now you no longer need code that checks if it exists as that will throw a security exception. Now you just write to the EventLog as usual but now using your new custom source. Your article are really awesome,Actually I was in search for some good articles on Create Log Event in Windows Azure and finally I got one. Thanks Everyone for your nice post. Is not missing all DiagnosticMonitorConfiguration stuff?